But it would be the Pirates' day, keeping cool under pressure to take their first win of the season. Jan Tops, Co-Founder GCL: "You can’t afford to make a mistake. With the new system it is much easier to follow. London Knights are in the lead in the overall GCL ranking. 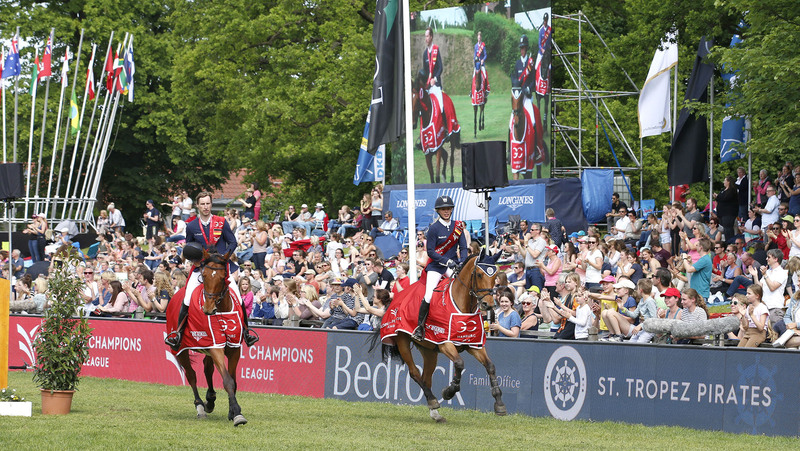 They have a great young team, very good riders and horses and they are very determined all year - tactically planning where to send their riders and horses." Volker Wulff, LGCT Hamburg Event Director: "We had a really good event and you could see the crowd was in the whole class. It is a good step to do it this way where you don’t know until the last rider who is the winner. It is a good innovation for the League." Pieter Devos, St Tropez Pirates (Winning Team): "That is what this is about, putting the pressure to the end. It was a super competition, it was really important to be clear. Laura did a super round, but had one down so I knew I had to go clear. It makes extra pressure, but makes everything more exciting. That’s what is is all about it was super sport today." Laura Klaphake, St Tropez Pirates (Winning Team): "To be honest I really enjoyed being part of the team. I really tried my best. My horse was amazing. It is a completely different thing to be part of the team, I really enjoyed it and I got some really good tips from Pieter and Edwina." Maurice Tebbel, Valkenswaard United (Second Place): "It is a really good team and a pleasure for me to be part of this team. Today was a bit unlucky for us, but second place is really good. I think it was really close and really interesting for the people here and for the new system (of the GCL) it is good for the people to understand and I am looking forward to the future. It was super interesting to ride for the first time in a team." Shane Sweetnam, Shanghai Swans (Third Place): "We were in the hunt until the last rider and if we were clear we would have won today. That is what we are aiming for, it was vey exciting, a great crowd here backing all the riders. It was great. I am lucky I have a good group of horses at the moment so it’s great to be that consistent and I am lucky to have these horses. "I think the new system (GCL) is a lot easier to understand. People are getting more involved, everyone is very positive and a lot of people are following. I got a lot of tweets and WhatsApp messages today saying it was very exciting and that just tells you there is a big following."